As you open the app, you will find a list of basic effects on the extreme right-side of the screen: Zoom, Brightness, Contrast, Threshold, Negative, Grayscale, Colors, Blur, Rotate. And, just below the list, you will find ‘Cool Effects’ options, clicking on which will take you to a page where you will find many more photo effects. You can easily preview all, one by one. Now, once you finalize and apply an effect, now you can save it to your local picture library. To pick a photo from your local machine, just right-click anywhere on the screen, you will find option: ‘Pick Image’. Let me quickly bring you the main features of this Windows 8 photo editor app. Lets you apply amazing effects to your photos. Lets you enhance your images. Supports formats such as .png, .jpg, or .bmp. You can zoom images, apply effects such as Sepia, Posterize, Bold Colors, Recolor, Hot, Cold, etc. Lets you easily rotate pictures, blur images, etc. Lets you upload images from your local machine. Lets you save edited images to your local picture library. Well.. it’s a good fun photo editor app for Windows 8 where you can apply amazing photo effects and post these photos to your Facebook wall and get as many likes as you can. Also, check out our posts on Photo Editor Apps, Photo Makeover Apps, and Image Resizing Apps. Proceed with on-screen installation steps. 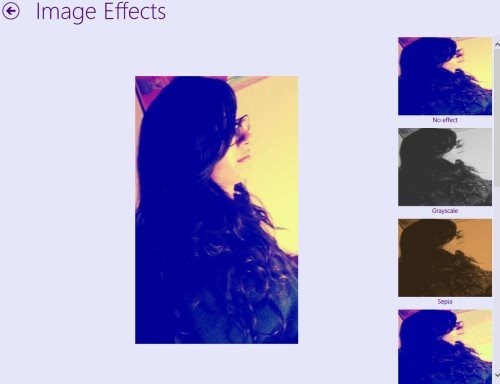 In short, Image Effector is a good fun Windows 8 photo editor app to apply different photo effects on your photos and create a unique one. 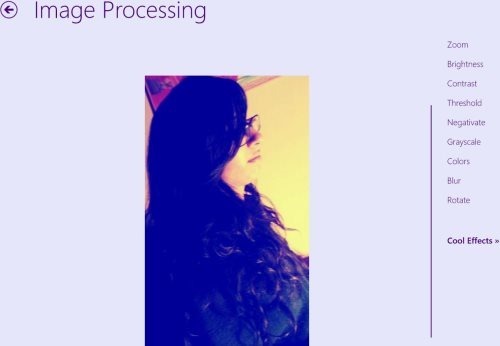 Go ahead and download Image Effector app in Windows 8 now.